Donald Trump will end the speculation surrounding his bid for president at the end of the week by naming a running mate, he said Wednesday night. "I will be making the announcement of my Vice Presidential pick on Friday at 11am in Manhattan. Details to follow," he wrote in a Twitter message. The presumptive Republican presidential nominee met Wednesday with politicians thought to be in the running to serve as his vice president, should he win the election in November. Just one day after he appeared at a rally with Indiana Gov. 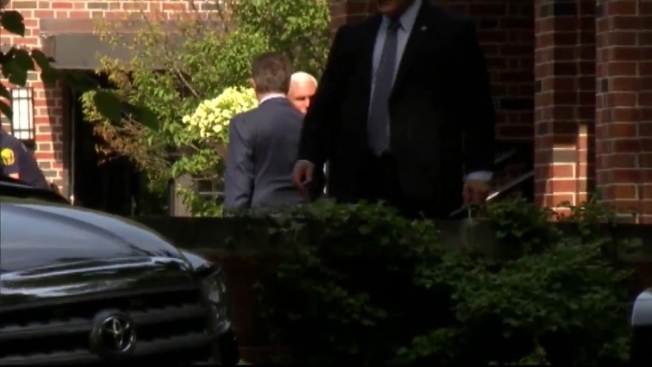 Mike Pence, Trump and his family met with Pence at the governor's mansion, fueling further speculation he may announce Pence as his running mate. Trump and his family were seen at Pence's residence early Wednesday morning. Pence and Trump stood together and waved to the cameras at 10:30 a.m. before Trump's motorcade left the residence. In a brief news conference later Wednesday, Pence said he's "honored" and "humbled" to be in consideration. "The conversations that we've had between two families are something Karen and I will cherish the rest of our lives, whatever the outcome," he said. On Thursday, NBC News reported signs were mounting that Trump was preparing to select Pence as his running mate. Sources close to both camps told NBC News they were preparing for the likelihood of a Pence pick, but said the final decision would be left to the billionaire businessman. Trump and his family met with others besides Pence Wednesday. Newt Gingrich was spotted with Trump's entourage at a downtown Indianapolis hotel on Wednesday. Sen. Jeff Sessions, of Alabama, was spotted arriving at the same hotel not long after Gingrich left. Trump's family, including Ivanka Trump and her husband Jared Kushner, also met privately with New Jersey Gov. Chris Christie Tuesday, NBC News reported. In his Wednesday news conference, Pence also talked about his visit with Trump over the Fourth of July holiday weekend, when he and his wife and daughter traveled to spend time with Trump and his family. "We saw him off the campaign trail, among friends and members of his company, and these are good people," Pence said. "These are people who have the best interest of America at heart, and I truly do believe that Donald Trump has the right vision for America. I think he's gonna provide the kind of strong leadership at home and abroad that's gonna make America great again. Trump told the Wall Street Journal Wednesday he has narrowed his list of candidates to Pence, Gingrich Christie and a couple of other politicians who haven't garnered a lot of attention, including Sessions. Trump is expected to showcase his pick at a public event Friday, multiple sources told NBC News. Pence, who introduced Trump at a rally Tuesday, has long been listed as one of several names being suggested as possible vice-presidential picks Trump could make. Gingrich and Christie have also been stalwarts on the the shortlist rumors. Still, Trump left the vice president question unanswered during his speech in Indianapolis Tuesday. "I don't know whether [Pence] is going to be your governor or your vice president," he said. "Who the hell knows?" Adding to the intrigue, there are several published reports that a private jet flew from Pence’s hometown of Columbus, Indiana, to Westchester County in New York — close to one of Trump’s golf courses — on Sunday. Before serving as governor, Pence was a congressman for more than 10 years and was mentioned as a possible presidential candidate in 2008 and 2012. While working as a private attorney, in the 1980s Pence also hosted a radio talk show in Indianapolis. He and his wife have three children. His grandfather, whom Pence is named for, was a Chicago bus driver who emigrated to Ellis Island from Ireland.